The benefits of strength training for youth are clearly documented. Yet teachers, fitness instructors, and youth coaches are often not sure how to proceed, and they end up watering down adult versions of strength-training programs. That is definitely not the way to go. 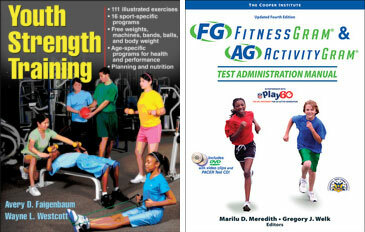 But authors Avery Faigenbaum and Wayne Westcott, with their 50 years of combined experience in teaching youth strength-training classes and coaching, can tell you the way to go—and back it with the most current research on instructional techniques and program design for youth. Long recognized as leading authorities on strength training, Faigenbaum and Westcott guide you in designing efficient, enjoyable, and productive programs for kids of varying abilities in elementary school (ages 7 to 10), middle school (11 to 14), and high school (15 to 18). You will focus first on broad-based, balanced muscle development, and then move into comprehensive, sport-specific strength-training programs. Youth Strength Training is the definitive source to guide you in designing and overseeing the programs of the kids you work with, whether you’re in a school, fitness center, or home setting. If you want to see high rates of strength development and spark a lifelong interest in strength-building activities, rely on Youth Strength Training. Fitnessgram/Activitygram is an integrated fitness and activity assessment program that can greatly enhance the effectiveness of school-based physical education programs. This updated fourth edition of the Fitnessgram/Activitygram Test Administration Manual is a complete guide to implementing these assessments, from conducting the test protocols and recording the data to interpreting and sharing the results.